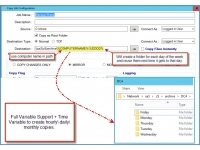 GS RichCopy 360 Enterprise – More Powerful than Ever! 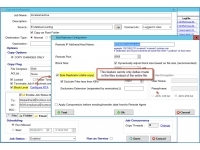 Not all applications are built for today’s demanding enterprise networks. Enterprise IT staffs don’t have the time to micromanage every supported application on their network. Today’s enterprise applications need to be able to run with complete automation. They need to be secure and they need to be able to integrate with the replication or backup from or to the cloud in many cases. 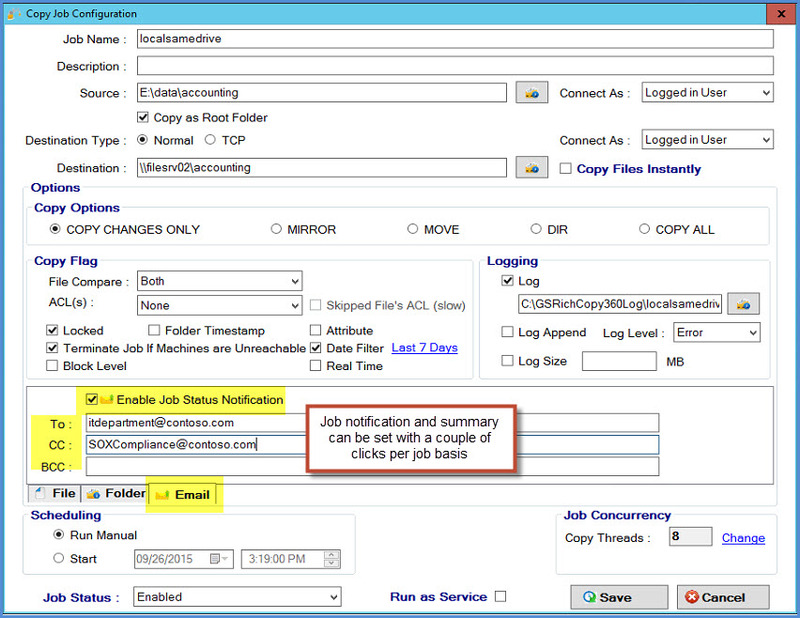 GS RichCopy 360 Enterprise does all of that and more! 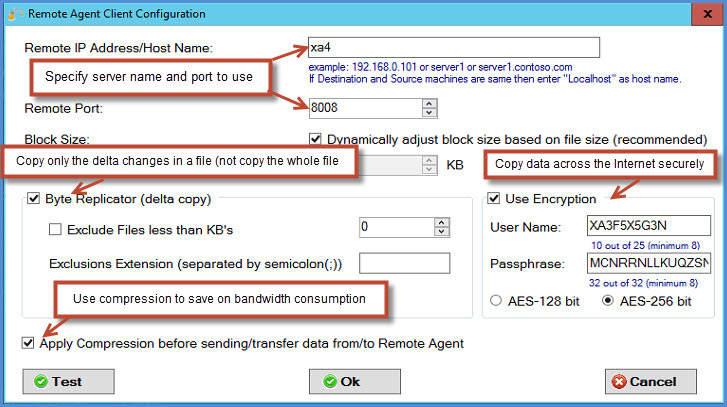 Copy files to a remote WAN location or across the internet (cloud) with 128/256 AES encryption and high compression ratio. 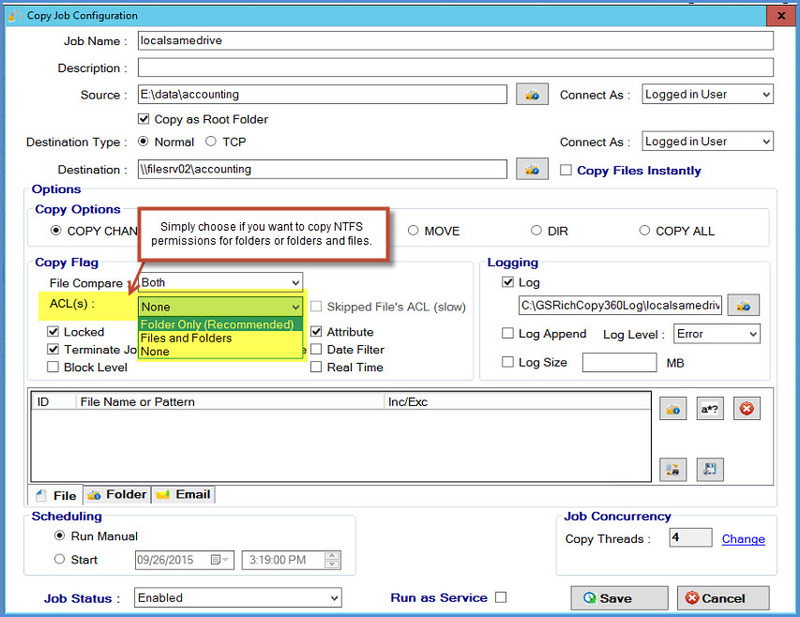 - Doesn’t require user intervention once the job is created when configured to run within our own proprietary scheduler. - Sets destination folders to have the same date and time stamp as the source folders, unlike most copy tools that assign the copy date to destination folders, not the modified date. 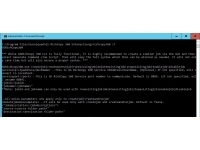 - Can copy files and folders that have long pathname (over 260 characters long). - Copies files simultaneously (up to 255 threads) resulting in robust performance and shorter time. 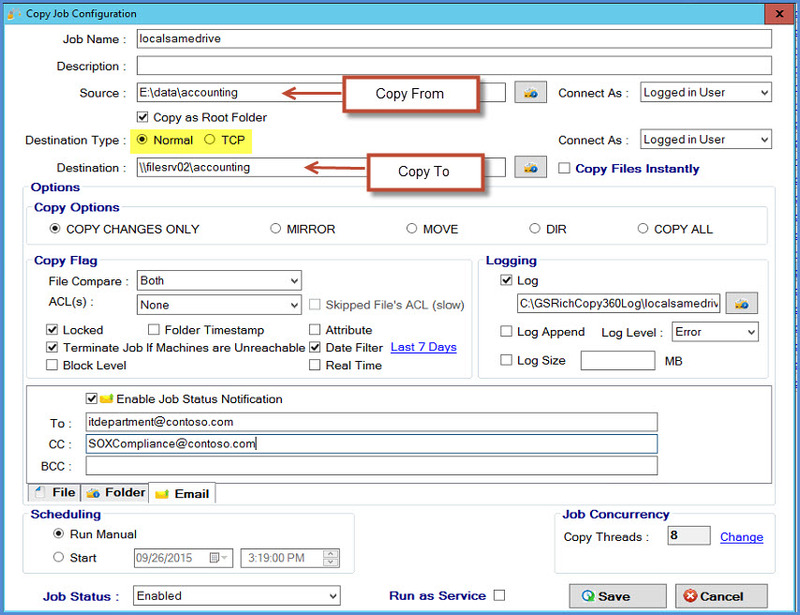 Yes, the application you’ve come to depend on for copying large files between your various internal drive locations is now available for robust, secure, automatic copying across the enterprise, even when the enterprise may be spread out amongst the clouds such as Amazon EC2 and Azure just to name a few. And just because it has to contend with firewalls and remote distances, GS RichCopy 360 Enterprise Backup and Replication Software is just as simple to implement and configure as its predecessor. Visit our product matrix guide for full feature comparison. 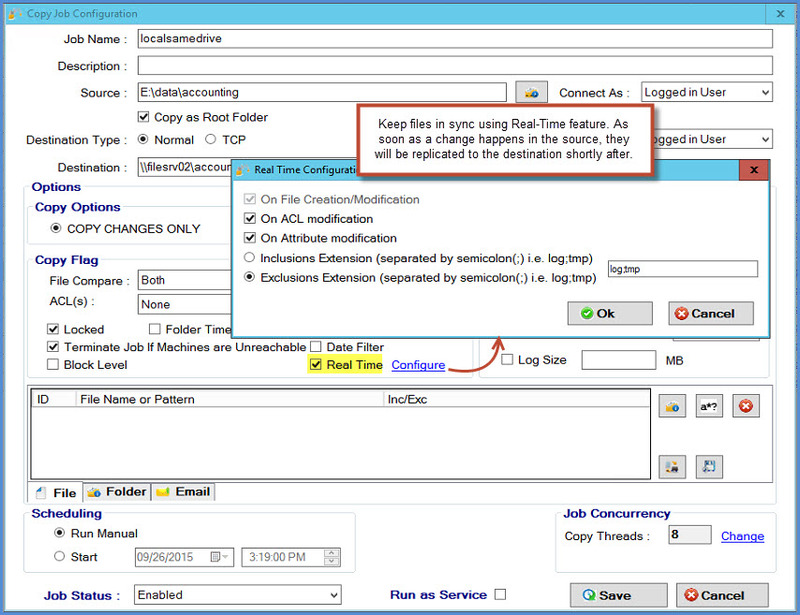 If you're a first time customer or it's the first time you are using file synchronization (replication) software solution, the easy-to-follow installation wizard will guide you through the process in minutes. 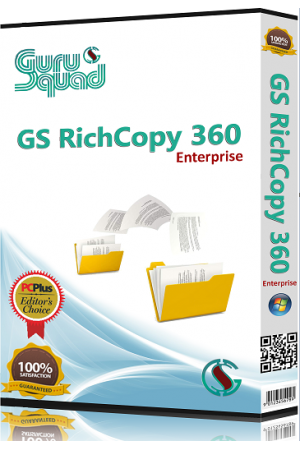 If you are upgrading to GS RichCopy 360 Enterprise version, simply uninstall your current version and install the robust GS RichCopy 360 Enterprise to begin experiencing fast file and folder replication. 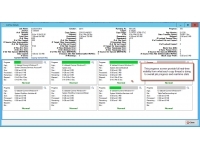 GS RichCopy 360 Enterprise combines file synchronization with byte-level replication so that files get copied in dependable automated fashion across your entire enterprise. 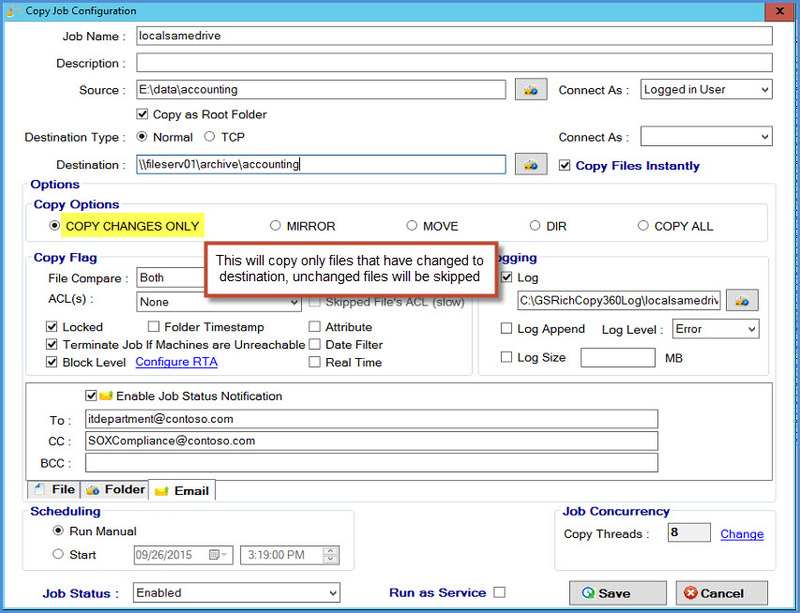 GS RichCopy 360 Enterprise automatically detects file changes which then trigger jobs. Once triggered, those jobs use Block Copy so that rather than congesting your enterprise’s precious bandwidth, only the altered data within your files gets transferred thanks to byte replication. What’s more, GS RichCopy 360 Enterprise dynamically selects the optimum number of bytes (you can just call it a chunk without getting too technical) to transmit, making it, even more, bandwidth friendly. Like all of many of our automatic functions however, the size can be configured manually. 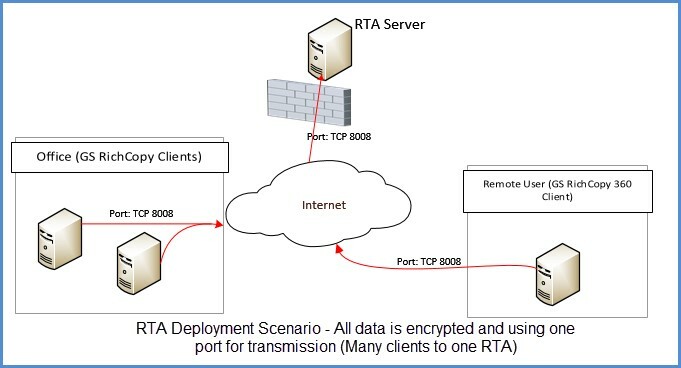 Whether you need to copy files to a distant remote shared drive located in the cloud somewhere or simply implement real-time file synchronization with your web server located on the other side of an interface in your DMZ, copying files remotely translates into working through your firewall. 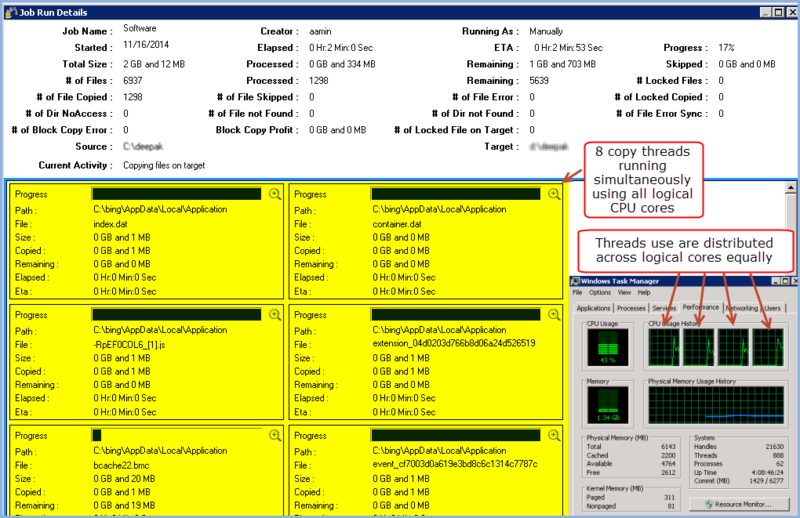 This is why we designed GS RichCopy 360 Enterprise to work through a single port. We chose port 8008 by default but you can change it to any single port you desire. Working with the cloud also means dealing with security issues, which is why GS RichCopy 360 Enterprise protects your data while in transit through an encrypted tunnel. Finally, working with the cloud can mean slow file transfer rates when working with large files, which is why GS RichCopy 360 Enterprise provides file compression to speed up the file copy progress. Replication is a powerful tool, but it also isn’t discriminating. 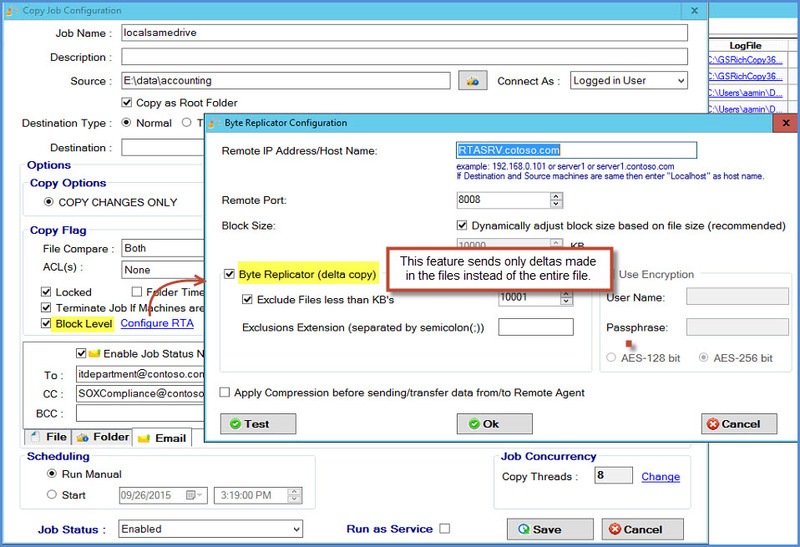 If a series of files become corrupt or a user incorrectly alters a file at the source drive, those unwanted changes will be replicated to the copy location as well, unless the replication is handled by GS RichCopy 360 Enterprise. 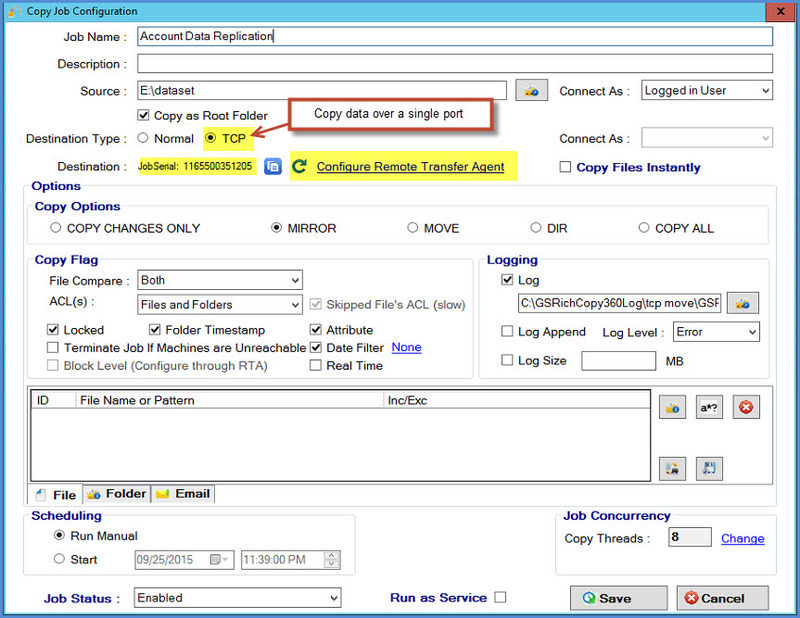 Whenever a file is modified at the source, GS RichCopy 360 Enterprise will back up the copied original at the destination target drive location before replicating the newly altered file. This ensures that you always have a prior version of every adulterated file that you can go back to. 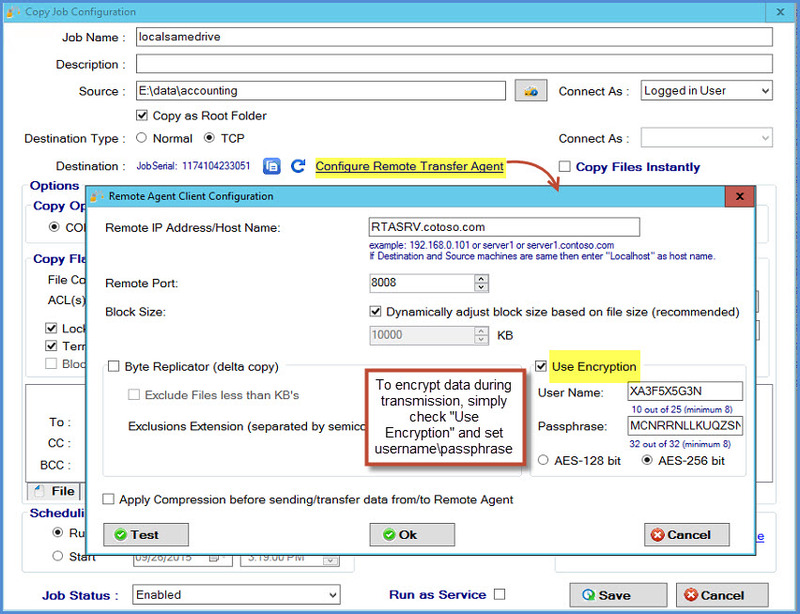 GS RichCopy 360 Enterprise ensures that the availability and integrity of your files are always preserved. 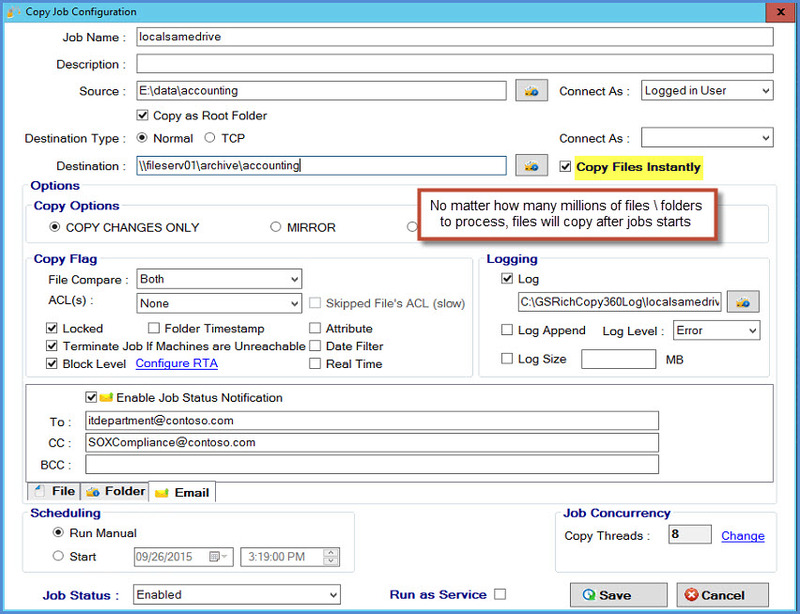 Rather than manually configure each file copy task in real time, GS RichCopy 360 Enterprise allows you to create bulk import jobs by integrating CSV files with Excel. How many jobs can you import? How about 1,000 jobs in less than 2 minutes! Importing is simple, allowing you to enact all of this power in just a few mouse clicks. 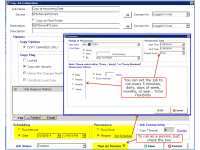 What’s more, completion of each job import is confirmed to you just as any superior enterprise application should. which provide friendly error messages in the event they should be encountered such as destination not reachable or access is denied in the event there is a permission issue. 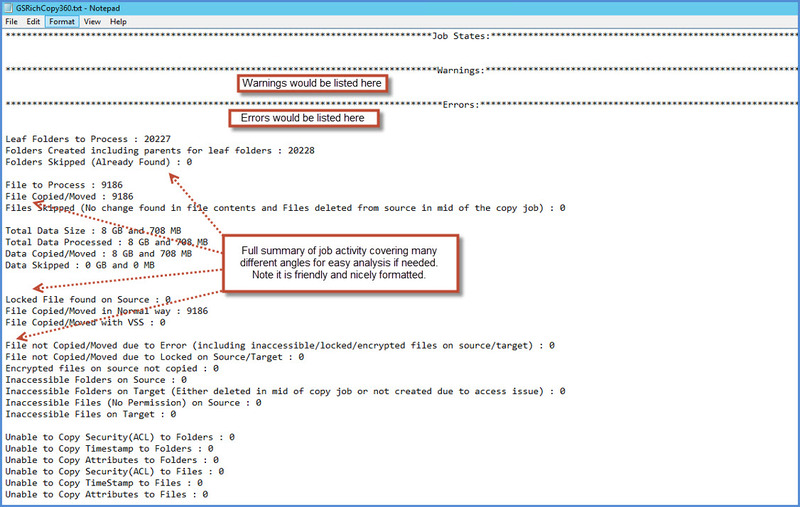 Environment Variable Support System and user defined variables are fully supported. 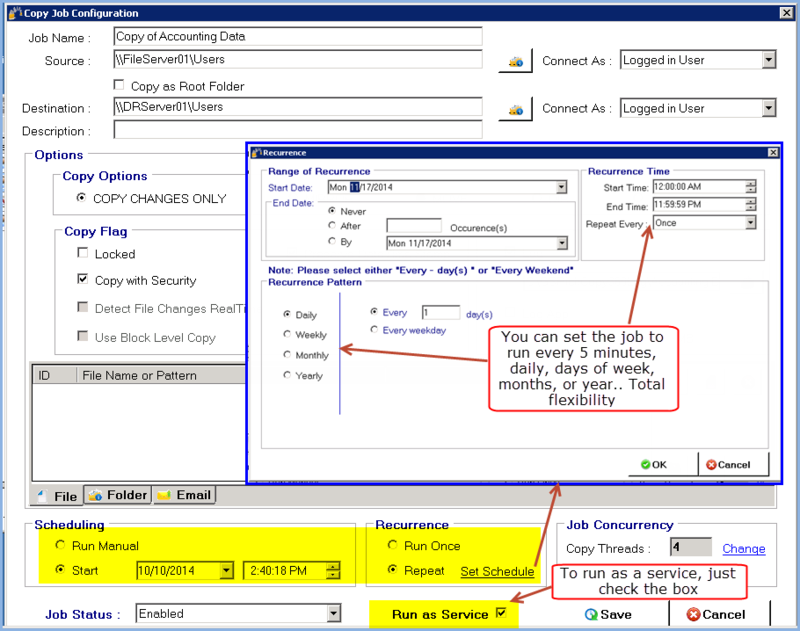 In addition, customer now have the option to use time variables so that a job can create a date folder in the destination such as \servershareMonday when it runs on Monday and \servershareTuesday when it runs on Tuesday. file with a few simple clicks. such as number of files to copy and how many has been copied, how many files were locked and copied, skipped, view all copy threads in action where no other competitor can. 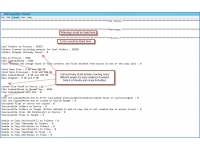 System and user defined variables are fully supported. 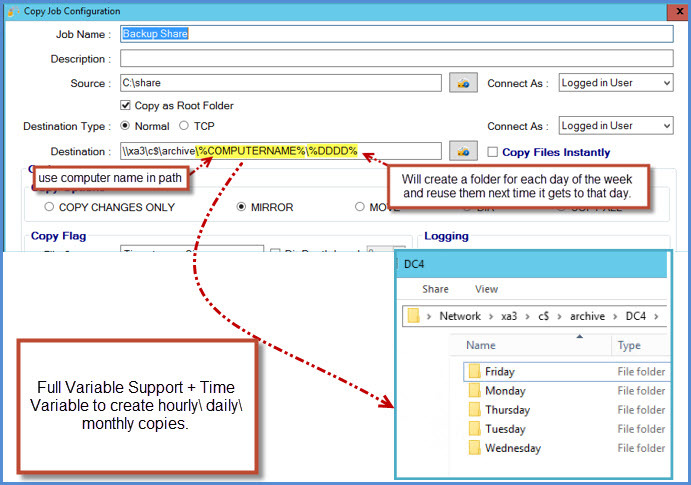 In addition, customer now have the option to use time variables so that a job can create a date folder in the destination such as \servershareMonday when it runs on Monday and \servershareTuesday when it runs on Tuesday. 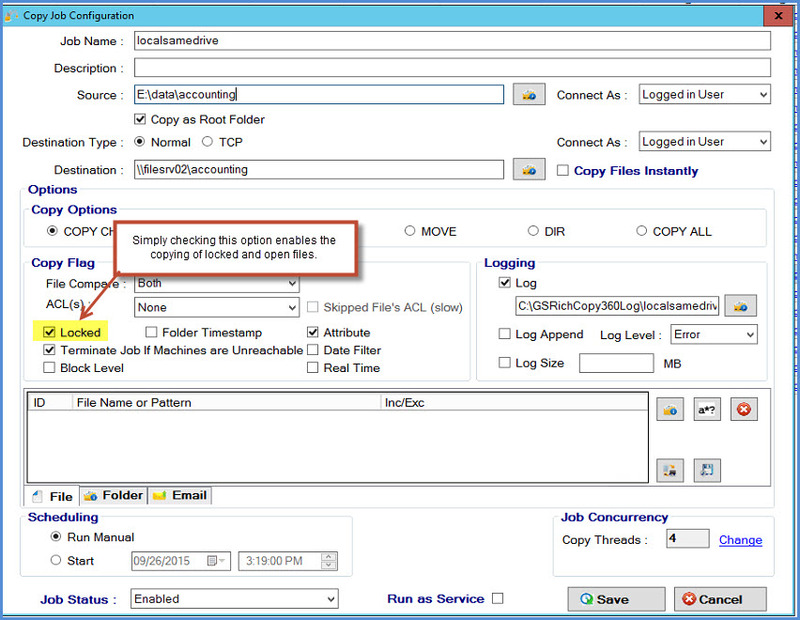 This includes Outlook files, Quicken databases, open SQL databases, documents, etc. 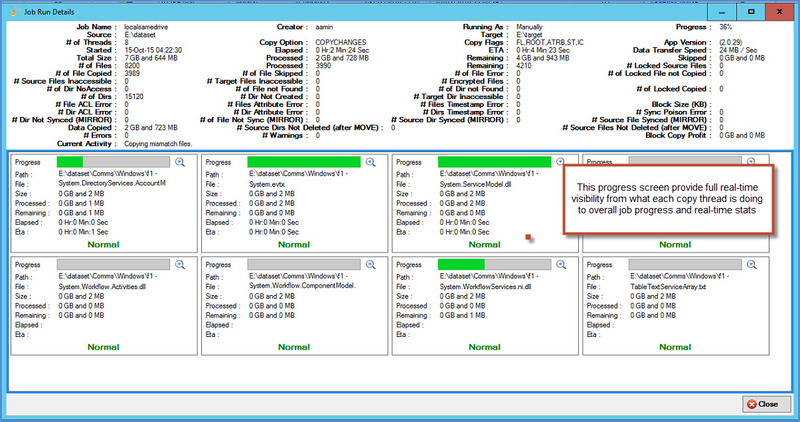 GS RichCopy 360 is fully integrated with the Volume Shadow Service (VSS) on Windows. which provides the ability to fully copy/move files and folders exceeding 260 characters long. No need to tweak it or pay it any special consideration. in addition to routine job scans ensuring recent are replicated within a short period of time. 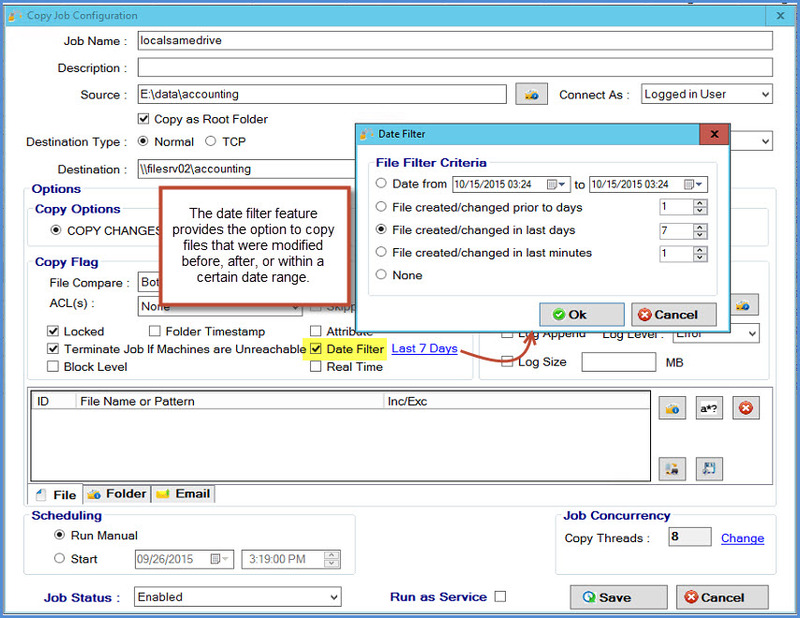 as a filter criteria where they can select to choose files (older than x dates, date range, or modifiedcreated with in the last x days). utilizing all available logical cores for maximum throughput. as job completes in case of failuressuccess or both. This is not only helpful for administration purposes but also for compliance such as SOX and HIPPA. 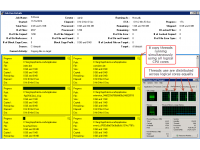 to overcome complicated firewall rules or to copy across the internet. which is useful when data is passing through foreign networks or less secure such as the internet or DMZ. to save on bandwidth consumption. 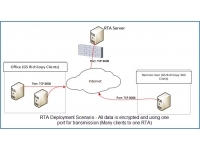 option to alleviate pressure on heavily utilized networks. regardless of how many files and folders there are to copy and process. to decrease replication time and save on bandwidth consumption by sending only the delta changes in a file instead of copying the entire file. and on timed interval utilizing own proprietary powerful scheduler. Jobs can be set to run at a specific time, on specific days of the week, month, year and repeat as needed. 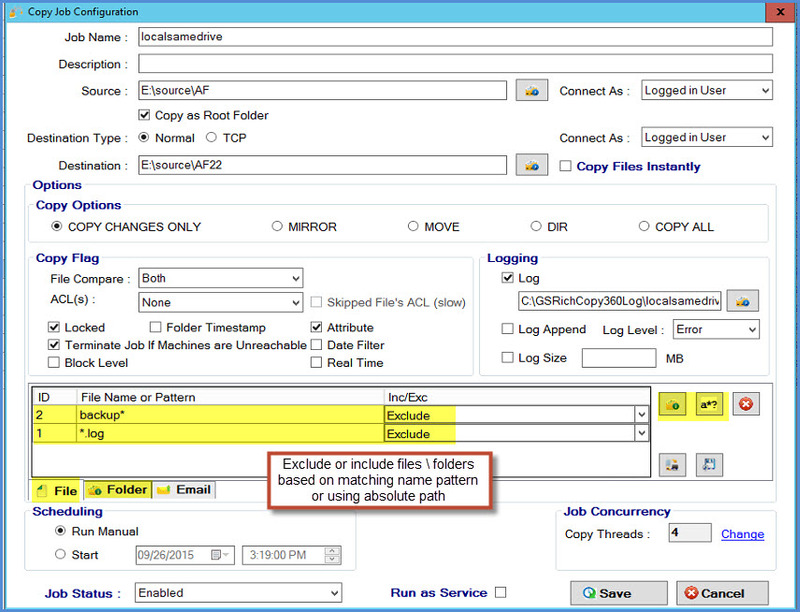 to set which files andor folders to copy using wild card pattern or absolute path. 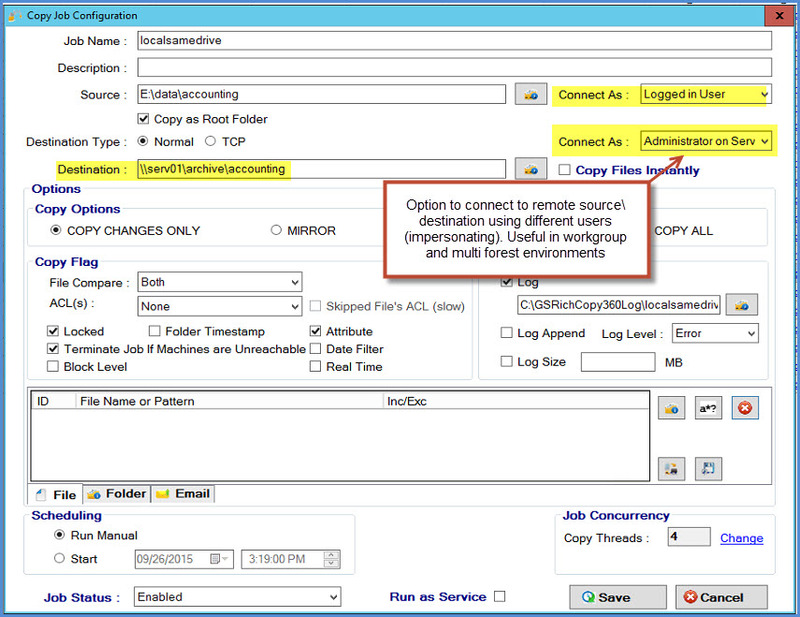 when connecting to a remote source or target which can be useful when dealing with workgroup or multi forest environments. 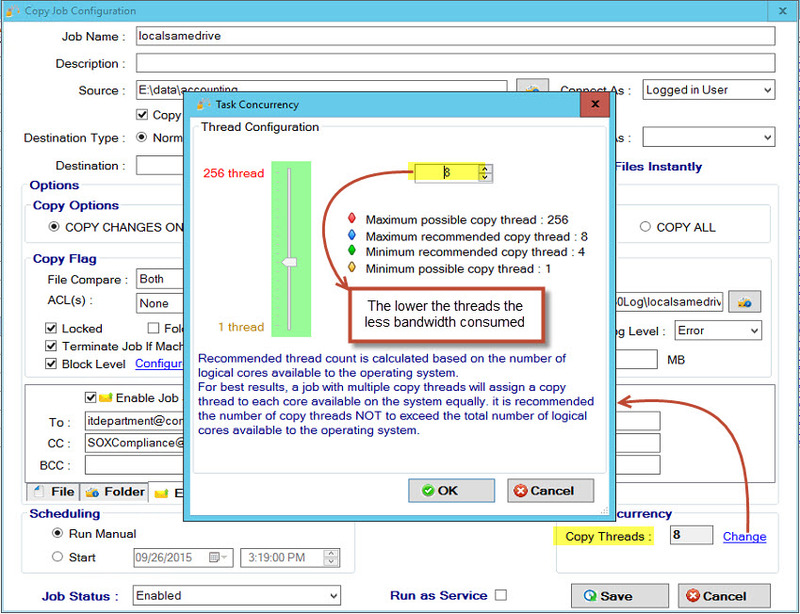 offers the ability to manage installed GS RichCopy 360 clients installed locally and ones that are installed on remote machines. 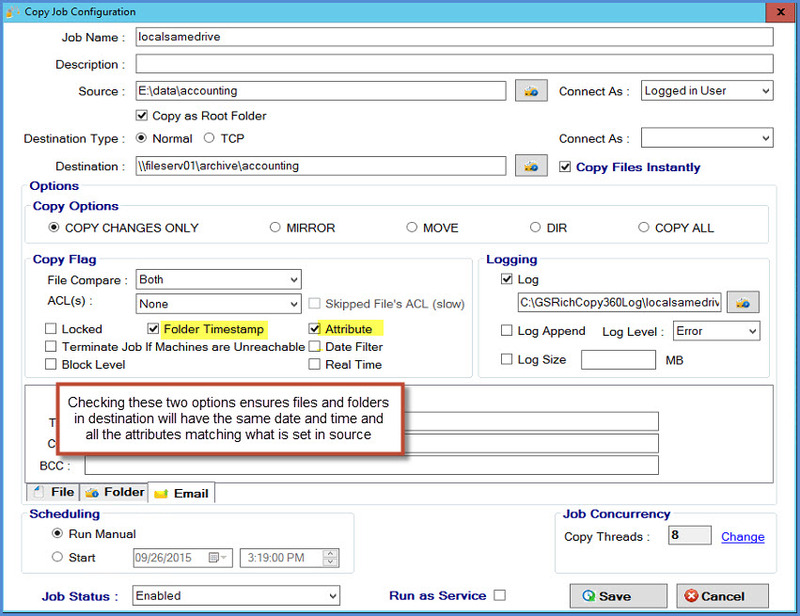 This provides administrators the option to mass configuremanage clients from one central machine.